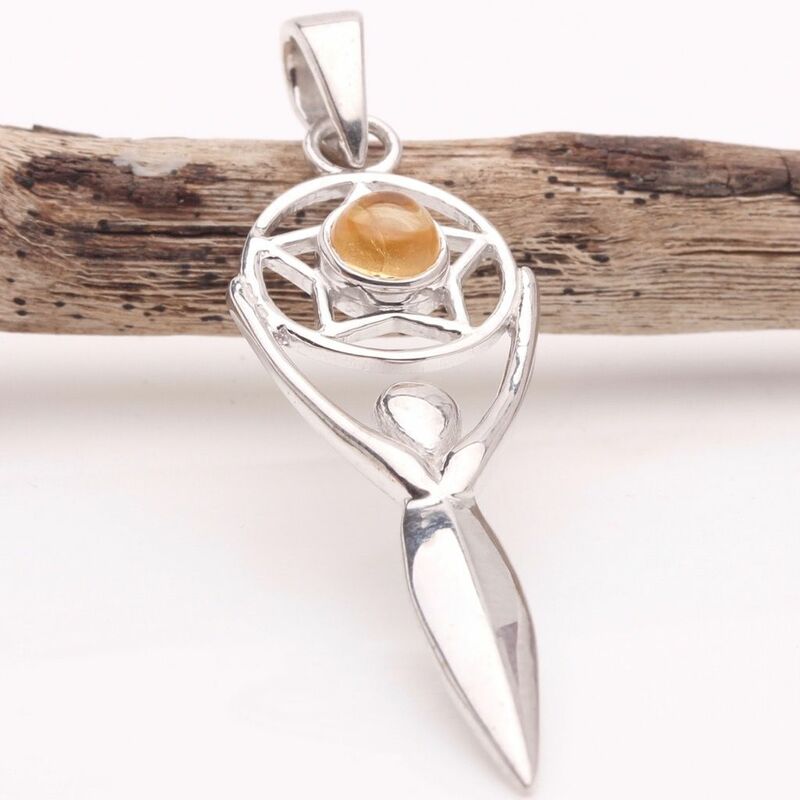 This sterling silver Pentagram Goddess pendant is a simple, clean line representation of the Goddess holding the pentacle symbol decorated with a Citrine cabochon. Measures 45mm including the bail and is 15mm at its widest point. 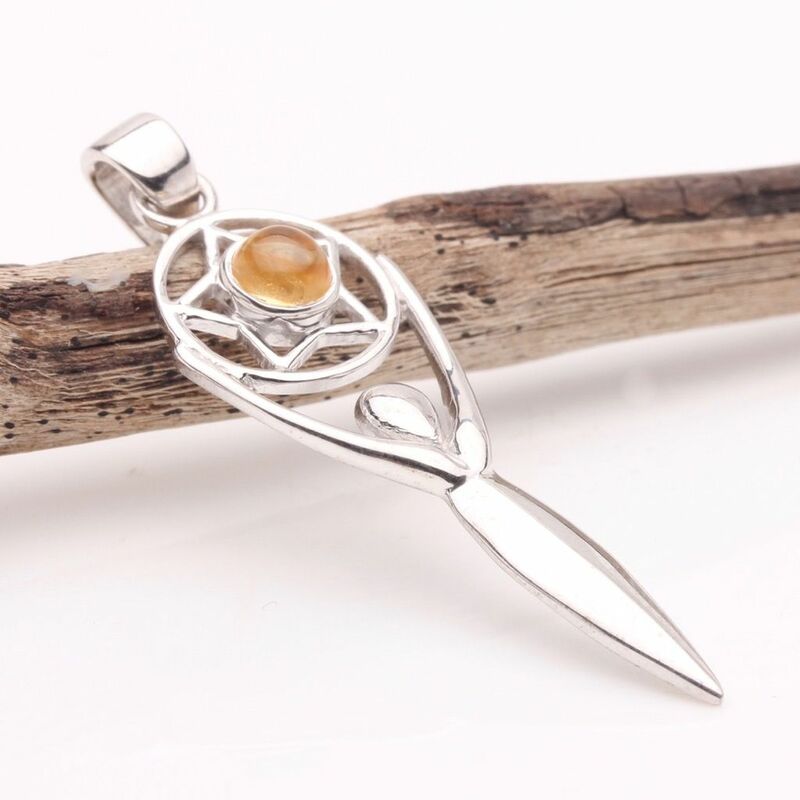 This sterling silver Pentagram Goddess pendant is a simple, clean line representation of the Goddess holding the pentacle symbol decorated with an Citrine cabochon. Since the dawn of time, many thousands of Goddesses have been worshipped; the very first beginnings are in the prehistoric times when women’s ability to give birth to new life was perceived as proof of their magical powers. The Goddess was recognised as Mother Earth – the ruler of birth. life and death. The decline of the Goddess came when humans began to move towards agricultural societies, and the mystery of birth was finally understood. Nevertheless, the symbols of fertility and cosmic creation were passed on and they were associated with the egg, the seed, the web-spinning spider, the water, the fertile earth. The moon is one of the most important universal symbols, as the waxing and waning of the moon is equated with the passage of birth, life, death and rebirth. The Goddess passed through all aspects – virgin, mother and crone – to be re-instated today by the rise of feminine movement, which rejects the subordinate role attributed to women.